Amy (old posts, page 39) | Blog-O! Our train was scheduled to leave at 8:30, so we arrived at Union Station at 7:30, possibly a little too early but I'd always rather have time to kill than hurry, especially with kids. We picked up our tickets, then treated the kids to Cinnabon cinnamon sticks, which were to be the first of many delicious, unwholesome treats over the week ahead. On board the train we settled in, luxuriating in the space and comfort. We played with the trays and the buttons on the seats, working out all the different lounging possibilities. The train started moving on time, and not twenty minutes later Cordelia wanted to know if we were nearly there. I explained that we would be there after lunch and dinner, so she only asked two or three times more. I was alert and fully conscious in the morning, and it's a good thing I decided to get some work done then because after lunch I became listless and sluggish. It's a paradox that sitting around conserving energy is more enervating than being active, and by around 2:00 in the afternoon all I was good for was staring out the window looking for the dog, bicycle and yellow-leafed tree that Delphine's bingo had set me in search of. New York State is not at its most beautiful in early spring; for hours, it seemed, the view was of grey swamps and grey trees, with only an occasional raven or hawk betraying life. In between the swamps there were brief views of farms and farmhouses on the higher ground. Eventually the swamps gave way to a wide river (the Hudson, it turns out), flowing fast with great slabs of ice thrown up on either side of it. The opposite bank of the river was a towering chunk of rock scattered with leafless trees. The view was monochromatic and beautiful in its severity, like an Andrew Wyeth painting. After dinner the children really started to get fidgety and fretful. Their normal routine has them going to bed almost immediately after dinner, but they weren't able to get to sleep at their usual time. On top of that, the day of junk food combined with very little activity left them both with upset stomachs. Cordelia finally fell asleep about forty minutes before the trip ended, but Delphine wasn't able to sleep at all and was tired and emotional when we rolled into Penn Station. The decision to take a cab to the hotel was an easy one, even for Delphine who hates cars. Cordelia's crying about her tummyache all the way to Queens didn't impress the cabbie much, although he did not betray any emotion. Then I unknowingly undertipped him — tipping makes me panic a little bit at the best of times, and late at night after a day on a train is not the best of times. Sorry, Abdullah, wherever you are. We arrived at the hotel around 10:15 pm and after settling in and brushing teeth we all went to bed feeling much better, glad to have finally arrived and excited about the next day. Moral Disorder by Margaret Atwood is a series of stories about a woman named Nell. The stories start in her childhood, move on to a weird (but just normal-weird, not freaky-weird) relationship with an older guy, and then ends with a pair of stories about her childhood and her relationship with her mother. Good, entertaining, interesting. Baking Cakes in Kigali by Gaile Parkin is our second book club book. (The girl who's planning this month's meeting decided we needed something a little lighter after The Things They Carried. On the one hand, Rwanda; on the other hand, cakes!) Baking Cakes in Kigali is about a community of ex-pats of various countries who have come to Kigali to participate in (or take advantage of) the post-war rebuilding and spending. Centreing the book on non-Rwandans is a great way to write a book about Rwanda without asking us to get into the heart of someone who lived through the genocide. Not that that's not a worthwhile thing to do, but it's not this book. Our main character is Angel, a Tanzanian grandmother who has recently launched a custom cake business. Her husband works for the university, and is the reason they are in Kigali. They live in an apartment complex populated by people from other parts of Africa and the world, and one of the delights of the novel is reading Angel's thoughts on cultural differences within Africa. The main charm of the book is Angel, actually: her thoughts on her neighbours, on feminism, on running a small business, and on coping with hardship are reminiscent of the levelheaded philosophies of Alexander McCall Smith's Precious Ramotswe. Baking Cakes in Kigali isn't a work of great literature, but it was a pleasant and easy read and raises enough discussion points that I think it will make for a good book club meeting. Odd and the Frost Giants by Neil Gaiman was perhaps an unnecessary diversion from my TBR list, but Delphine had it out from the library and I hadn't read it, so I did. Besides, it was short. It's the story of Odd, who is odd and not entirely wanted at home, so he goes away. While he's away, he meets some more odd characters: a bear, a fox and an eagle who aren't behaving as you might expect a bear, a fox and an eagle to behave. Events transpire, Odd quests and succeeds, learns about himself and his family, saves the day and returns home stronger. It's a wonderful little book, as you'd expect from Gaiman. He has a gloriously gentle, deadpan way of ushering you into his imagined world that I loved in the Sandman comics. 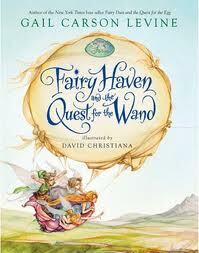 Fairy Haven and the Quest for the Wand by Gail Carson Levine. Once upon a time I told myself I would read all the books my kids read. I don't know what crack I was smoking, because a) I don't even have time to read the books I want to read, b) Delphine reads about a million books a day, and c) she reads some serious crap. Good stuff too, but lots of crap. This one intrigued me, though. On the one hand, Disney. (That's bad.) On the other, Gail Carson Levine. (That's good.) On the one hand, fairies. (That's bad.) On the other... Gail Carson Levine? Well, and I also love the illustrations, by David Christiana. And Delphine really enjoyed it. So I gave it a read, and hey, it turns out to be pretty good. The fairy characters are interesting and well-rounded, in non-obvious ways. (Turns out Tinkerbell fixes things - she's a tinkerer, get it?) The conflict was exciting, the climax was thrilling, the writing was lovely. Gail Carson Levine trumps Disney! 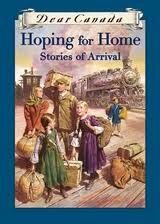 Hoping For Home: Stories of Arrival is from the Dear Canada series of historical novels written as diaries. This one is a collection of short stories about immigration. (Well, and one about an aboriginal girl, which I guess was put in for political correctness but since it's not actually about crossing the Bering Strait/Pacific Ocean thousands of years ago I think it's a bit of a stretch to include it in a collection about immigration; and another story which I'm not sure what it was about.) The authors include Rukhsana Khan, Paul Yee, and Jean Little. For some reason I love immigration stories, maybe because I immigrated/emigrated so often as a kid, maybe because I find the fact that people choose Canada as their home perversely flattering, definitely because I am in awe of the courage of people who come here with so little resources and so much hope. Whatever it is, this book satisfied me with lots of good stories, although I'm not a great fan of the diary conceit. I often felt that the writing was too good to be a diary, especially a child's diary, and that pulled me out of the story. The author who really captured a child's voice was Brian Doyle. I also particularly enjoyed Paul Yee's story of a boy joining his father in small-town Saskatchewan; he brings the reader on the same voyage of discovery that the protagonist is taking. I'm currently working with Greg Wilson on The Architecture of Open Source Applications. It's a collection of essays written by open source coders about the architecture of their projects. I'm mainly the format monkey, but sometimes Greg lets me out of my cage to do some editing. Last week he set me loose on a chapter which had some problems with structure to see if I could come up with some helpful comments for the author. I knew the chapter bothered me, and to begin with I could specifically point to one problem: the author didn't introduce the subject of the chapter until the fifth paragraph of the second section. (He'd been talking about and around the subject until then, but never overtly linked it to what he was saying.) Apart from that I didn't have anything specific and helpful to say. Also I didn't know what to do next. Don't tell anyone this, but I'm not really an editor. Okay, I'm an "editor" in the same sense that I'm a writer: I edit. But I'm not, say, seasoned. Experienced. I'm new to this. So I didn't know how to approach this chapter. I tried a few things. First I read it again. (Of course further complicating matters was the fact that the topic of the chapter is not something I was familiar with, so not only was I editing the chapter, I was simultaneously learning from it. 1) Reading it again helped me understand the subject better but I still didn't know what I needed to say to help the author make the chapter better. Next I wrote out an outline of the chapter, to try and see the overall structure. That helped me see that the author never clearly stated the problem he and his team were solving. But I felt like the outline was too static — I wanted to be able to move things around. What I ended up doing was rewriting the first section to clean it up and make it into an actual introduction, and asking the author to introduce some other topics more effectively (and gently) later on in the chapter. I hope I will get a chance to tighten up some of the language and take out excess material later in the editing process. The whole process was fun but also made me very uncomfortable. As I was doing all that outlining, cutting, pasting, researching and thinking I felt insecure and kind of dumb. "Is this what I'm supposed to be doing? Is this going to work? Am I wasting time? Should I do something different?" I hate doing things I don't already know how to do, and I had to keep reminding myself that this is how you learn — you flail, you try things, you screw up, you try other things, you get better. It does take time and it does make you feel stupid, but then after it's over you know a little bit more. 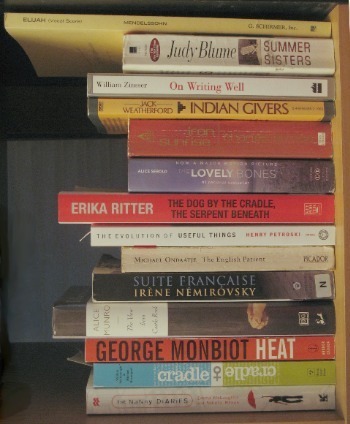 Last year I made some kind of resolution about reading half the books on my To Be Read shelf. Our bookshelf (it's a 5 by 5 Expedit, which they apparently don't make anymore) has little squares, and right now my TBR pile is taking up two cubbies. 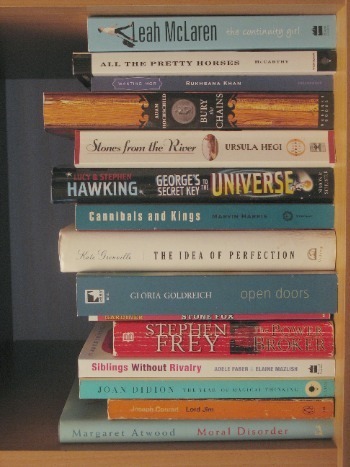 I wanted to reduce it to one, but somehow the size of my TBR pile remains constant. Like everyone, I imagine, I tend to avoid particular books. Various reasons: maybe a book seems hard, maybe it's one I feel I "should" read but don't actually want to, maybe I'm just never in the mood. Anyway, I find that some books lurk in the TBR shelf for months and years while some just disappear within weeks. This year I decided to steel myself and tackle the shelf alphabetically. There are a couple of rules. You'll see that the Judy Blume book is out of order: that's my wild card. If I just can't face the next book on the list, I get to read Summer Sisters. It's my only wild card, so I have to use it wisely. Also I can interrupt the sequence at any time for library books, book club books, or books which need to be read right away for another reason, like how-to books. Let's see how far through the alphabet I get this year. I picked up I Know Why The Caged Bird Sings by Maya Angelou for free, or very cheap, somewhere because I knew I should read something of hers. I didn't know anything about her apart from that she's an American poet and highly respected. I didn't know anything about the book, either, apart from recognizing the title — I didn't know if it was poetry or a novel, if it was going to be hard to read or light (didn't really expect it to be light). Turns out I Know Why The Caged Bird Sings is a memoir of Angelou's peripatetic and eventful childhood in Arkansas, California and St Louis, and while it wasn't light, it was an easy read. For the most part the language is straightforward (but beautiful) and the story is told forthrightly, without undue metaphor or digression. Occasionally Angelou steps out of her narrative to provide a larger context for a situation, or to reflect on an event with the wisdom of hindsight, but these asides are insightful and welcome. I didn't expect to enjoy the book as much as I did, and I now find I want to know what happens next (the book ends when Angelou is sixteen). Where does she get her last name? What happens to her brother? I suppose I could find out from Wikipedia, but I'd rather have the story unfold in the author's words. Lucky for me her memoirs continue in Gather Together In My Name. I read Why We Get Fat: And What To Do About It by Gary Taubes after reading this very enthusiastic review in Skeptic Magazine's e-issue. As you can see, sceptical dude there thinks this book is pretty great. Then he lays out some more science, this time about how fat works, or more specifically how insulin works. Turns out insulin is evil: it inhibits the use of fat as an energy source, it forces fat cells to take lipids from the blood and store them as fat, it causes the body to create new fat cells. And what makes your body release insulin? Carbs! Ergo carbs are also evil. So. This was an interesting book, and certainly compellingly argued. Not that it has any scientific value, but my personal experience certainly dovetails with Taubes's arguments. (The only time I lost any significant amount of weight and kept it off was when I cut carbs (although I didn't think of it that way): I stopped drinking juice and buying a dozen bagels every week.) There are counter-arguments to Taubes's conclusions on the Internet which I have yet to read, but for the most part the book rang very true and has definitely changed the way I think about fatness and nutrition. Although I won't be switching to that all-meat diet any time soon. My children are creative and clever and interesting. The second book I read this year was the book for our first book club meeting. The Things They Carried by Tim O'Brien is a collection of stories about the Vietnam war, and coming home from the Vietnam war. (And trying to avoid going to the Vietnam war.) It's also about storytelling, cameraderie, belonging, and the slippery morality of war. The book club had an interesting variety of reactions to this book. One of us said she couldn't relate to any of the characters in the book on account of them being men, but that she really enjoyed the writing. I thought the writing was compelling but I didn't really notice it. Which would normally be a good thing, but I feel like I should notice writing, pay attention to it, so I can improve my own writing. I guess that's what the second reading is for, but I'm too impatient to read anything twice. Something to work on. Another book club member thought she didn't like it, but in retrospect realized that she liked that one part... and the other chapter... and that bit about... actually it was really sticking with her and that must be good. It's that kind of book — you may not enjoy reading it but it gives you lots of things to think about. I liked it — the characters were compelling, and I liked the ideas and questions it raised, especially the question of the difference between a true story, and something that really happened. Right now, in Toronto, where I am, it is cloudy and -10°C. Right now, in Honolulu, where Blake is, it is mostly sunny and 24°C. I saw my friend Julia at the grocery store this morning. She wanted to know what was new, and I told her my husband was in Hawai'i all week. She was outraged on my behalf: "What are you going to get out of this," she wanted to know. "I get to stay in Toronto and look after my children!" That, however, doesn't change the fact that I would really like to be in Hawai'i. (In fact, it kind of makes it worse.) I'd like to be in a hotel in Hawai'i with new neighbourhoods to explore, new food to try, new beaches to walk on, and no horrible freezing weather to endure. I haven't been anywhere new since I was in Las Vegas in 2004, and I haven't been anywhere I really wanted to go since I was in New York in 2003. And I'm so sick of this cold. I don't know the answer. There's no way for me to go somewhere interesting for free, and it wouldn't be "fair" for me to spend a bunch of money we don't have to go on holiday somewhere just because I would really like to. I'm certainly not owed a holiday. They did a study on monkeys: you can get monkeys to do tricks if you reward them with bit of cucumber, which they like. However, if they see that you're rewarding other monkeys with grapes, which they love, they'll stop doing tricks. They know it's not fair that the other monkeys are getting grapes, even though their cucumbers are pretty good and were considered fair reward until they noticed the grapes. Right now this monkey is not too happy with her cucumbers.